Luxury and comfort are combined to create the Era Nouveau Casper 6 Piece Sectional. 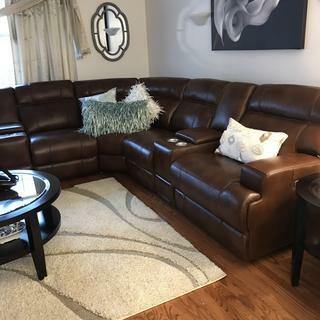 This power leather sectional in rich whiskey brown features plush cushions that envelop you in comfort as you recline at the touch of a button. Power headrests allow you to adjust your head to the perfect spot for watching TV while fully reclined. A storage console equipped with cup holders complete the functionality of the piece. Comment: Includes: Leather Power Left Arm Facing Recliner with Power Headrest, Leather Armless Chair, Leather Corner Wedge, Leather Armless Recliner with Power Headrest, Leather Power Right Arm Facing Recliner with Power Headrest and Leather Console. Price may vary based on option(s) selected. Poor leather quality that is paper thin. Rips easy. Do not purchase. The leather on this expensive sofa is paper thin. A slight friction is enough to tear it. This is a disappointment for such a pricey purchase. Just 3 days in the house it already ripped and a tech had to be called to repair it. Now 3 weeks later another rip. Who has time to keep calling and waiting for the repair man? The color is nice and design is good, unfortunately poor craftsmanship.